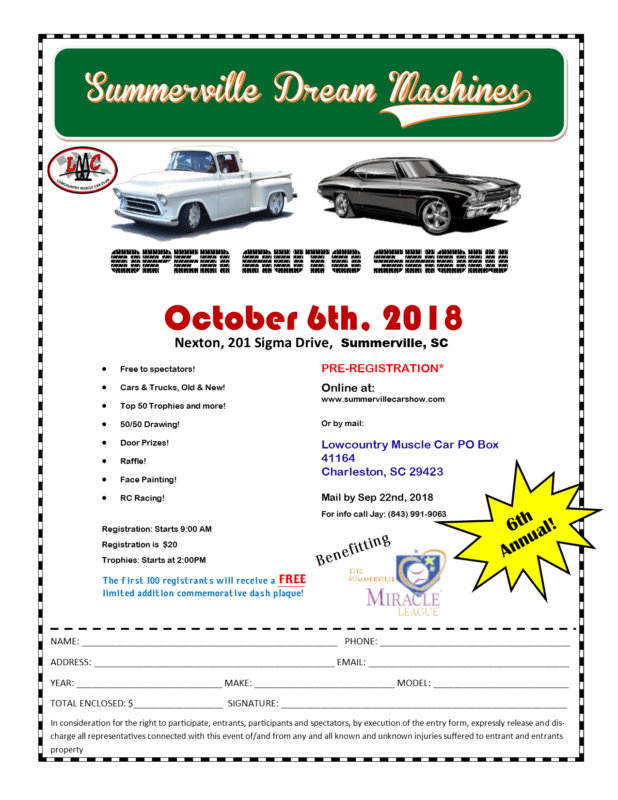 Benefiting the Summerville Miracle League (SML) each year on the 1st Saturday in October we hold our Dream Machines Open Auto Show! A family friendly event, and one of the most anticipated car shows in the Lowcountry, will be on October 6, 2018 at Nexton, 201 Sigma Dr., Summerville, SC 29483 (map). Lowcountry Muscle Car is a Summerville based auto club who wish to share their passion with our community while supporting the Summerville Miracle League in their mission to enhance the lives of people with special needs. We ask for your support for this year’s show which will be held on Saturday, October 6, 2018. With your help, this year will be better than ever!